During your initial service call, our trained technicians will talk to you about your pest control and concerns. We want to understand your home, learn about its history, what kind of treatments you have had in the past and more. Our trained technicians will partner with you, the homeowner, to determine what issues your home and lawn might be facing. Our pest control technician will do a thorough inspection inside and out. 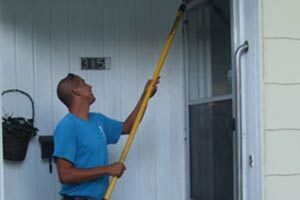 During the initial walk-through, our technician will inspect the perimeter of your home, looking for potential pest entry points and problem areas outside. Inside your home, our technician will inspect the baseboards, exterior doorways, plumbing areas, attic and windows looking for potential pest trouble spots. Once our technician has completed the inspection, you will be given a detailed report that will show the results of the inspection and recommendations that best suit the needs of your home. Copyright © 2019 VIP. Powered by WordPress. Theme: Spacious by ThemeGrill.